A ten-year-old Devon girl has hatched two chicks – from eggs bought at her local supermarket. Jessica Sansom, 10, put two of the organic eggs in an incubator the family had used to hatch geese and hens on their farm. March 14, 2007 Posted by oldstersview | Uncategorized	| Comments Off on Which came first, the duck or the egg? A Jack Russell terrier was rushed into surgery – after eating his owner’s false teeth. One-year-old Desmond gobbled down Marjorie Johnson’s dentures when she was in the loo, reports the Mirror. The teeth showed up on X-rays and vets had to open up his stomach in a £1,200 three-hour op. 15 years?? Well, everyone needs a hobby. 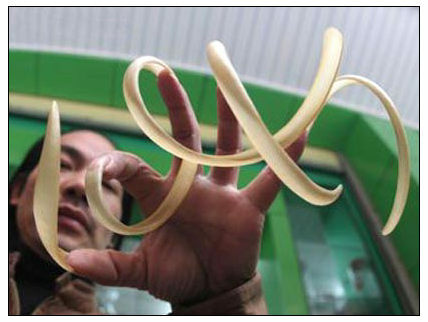 Li Jianping, 43, of Shishi City, Fujian province, says the nails on his left hand are one metre long in total. He told the Straits City News he was very proud of them but admitted they could be an inconvenience at times. “I never go to crowded places. And during sleep, I have to keep my left wrist under my head to prevent the hand from moving,” says Li, who owns a grocery store. The current length took 15 years to achieve, but he first started to grow them 23 years ago.